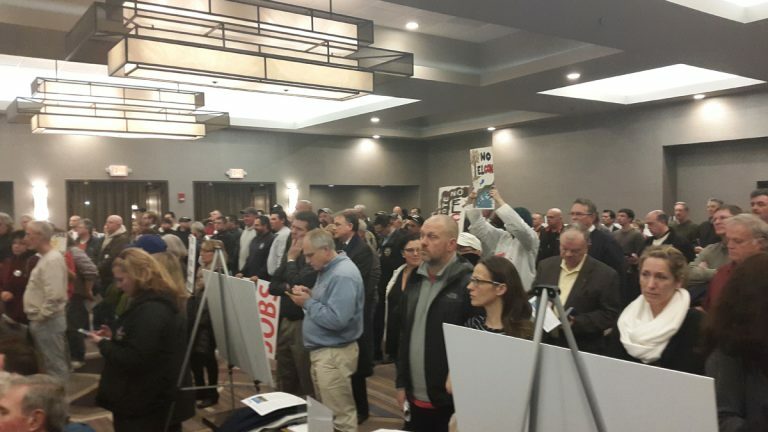 More than 250 environmentalists, residents of Lower Bucks County and union representatives packed a cavernous conference room in the Bucks Sheraton Tuesday night, to air grievances and give plaudits for a proposed hazardous waste water treatment plant. Elcon Recycling Services, an Israeli company, wants to treat toxic waste water generated in pharmaceutical, industrial and chemical manufacturing a the Keystone Industrial Port Complex in Falls Township, a site near the Delaware River. A former brownfield, the complex also can offer tax breaks to businesses located there. After one rejection from the Pennsylvania Department of Environmental Protection, Elcon passed through Phase I of the application process and is preparing to submit its application for Phase II in March. The meeting is one of several required by DEP at various points in the vetting process. Representatives from Elcon used the occasion to share how they had updated their earlier proposal following public comments and to hammer home safety precautions in their plan. “We have perfect track record, we have had no spills,” said CEO Zvi Elgat of the company’s existing facility in Israel, prompting a wave of coughing and retching sounds from the audience. Audience members debated each other and Elcon representatives — even how far from the Delaware River to the proposed site is. “Our facility is located about 6,200 feet from the river,” said consultant Rengarajan Ramesh. “That’s not true, that’s a lie!” shouted a woman in the audience. The site, at 100 Dean Sievers Place in the shadow of the former US Steel plant, is located closer than a mile to Biles Creek, a tidal tributary to the Delaware River. Activists from Protect Our Water and Air, the League of Women Voters, the Delaware Riverkeeper and the Sierra Club all charged that the plant could not be safely located close to such an important body of water. Residents shared fears about the plant’s proximity to the river which supplies drinking water for parts of New Jersey, Philadelphia and Bucks County. They also voiced concerns about air pollution and emergency planning. Project manager Marjorie Fitzpatrick fielded most of the audience’s questions and attempted to allay fears, even as information about the operation of the plant is subject to change through the application process. All waste will be screened for radioactivity upon arrival, according to Fitzpatrick, and the containers where the wastewater is treated will have secondary enclosures in the case of a spill. In its Phase II presentation, Elcon representatives sketched out an updated waste treatment process, although it did not go into the specifics of the high level science at work in the method. 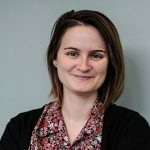 In this iteration of the plan, the plant proposes to take waste sludge and heat it to evaporate away the water content, leaving behind distilled water, salts and “remaining solids.” Those solids and salts would be sent to a landfill. Hazardous gases created by this process will be treated with thermal oxidation, using a natural gas flame to heat gases near 2,000 degrees Fahrenheit and breaking them into different, less toxic compounds. The first phase of building would create about 50 permanant jobs, according to Elcon. Bernard Griggs, business representative for the Building Trades Council, stood with representatives from the International Brotherhood of Electrical Workers to offer his blessing to the project. Many residents, though, spoke out about what they viewed as the their home becoming a hub for unsavory industries. Bringing up another proposed waster plant, this time for medical waste, Bristol Borough resident Jose Acevedo said, “It feels like the lower end of Bucks County has become sort of like a dumping site,” receiving cheers from the crowd. At the proposed Elcon site is also near to several large landfills. One commenter, a tall man in a plaid shirt, proposed giving residents money to offset potential downsides of living near the hazardous waste plant. A similar arrangement exists in Tullytown and other municipalities in Pennsylvania, where some of the money paid to locate there ends up in residents’ pockets. “I want a chicken in every pot and two Acuras in every driveway,” the man said.